"Un pianista increíble que entiende el poder de la sencillez. Zurmühle transmite una amplia gama de emociones, permitiendo que los silencios musicales sean tan expresivos como las mismas notas." 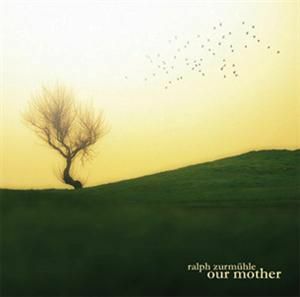 (en inglés) - "I am just blown away by the quality of music that has been coming across my desk this year, and one of the best of the best is Ralph Zurmühle's masterpiece, Our Mother. Swiss-born and classically-trained, pianist/composer Zurmühle now makes his home in Spain and also works in film and multimedia. An incredible pianist who understands the power of simplicity, Zurmühle conveys a wide range of emotions in these nine tracks, allowing open spaces to be almost as expressive as the notes themselves. Most of the music is on the melancholy and introspective side, with some of it achingly beautiful. Although his music doesn't sound like other artists' music, I would put Ralph Zurmühle in the same class of pianists as Michael Dulin, Robin Spielberg, David Lanz, and Michael Allen Harrison - artists who seem the most at home with their hands on a piano keyboard and who posses the playing skills to convey anything they wish to say in their music. Our Mother begins with Being There, a gentle, graceful piece that is intimate and almost conversational. The quiet spaces between many of the notes resonate with feeling. If you aren't hooked yet, try The Wind At My Back, which is lively, carefree, and one of my favorites. I love the spirit and dancelike quality of the piece and hope it is released as sheet music at some point! Hymn is more stately, but is also very prayerful, poignant, and deeply personal. There are two version of the title track. One is digitally orchestrated and the second is solo piano - both are compellingly gorgeous. While I was in the listening process of reviewing this CD, Our Mother kept causing me to stop what I was doing and listen with full attention. The melody line is so simple, yet so powerful. The piano version segues from the end of the synth version, continuing the piece with a different voice. Horizon is absolutely hypnotic, and that Zurmühle maintains a trancelike state for more than twenty minutes without becoming boring or repetitious says volumes about his artistry. The left hand plays a steady progression of three notes that rarely changes throughout the piece while the right hand tells the story, simply and directly, sometimes in the treble registers and sometimes crossed over into the bass. With the repetitious nature of this piece, I was amazed that it stayed fascinating over the nine times I listened to it. Don't try to wake up to it, though! David and Me is also very spare and almost mournfully sad. At twelve minutes, it tells quite a story of great emotion and deep love. The Return is a lovely, elegant ballad that has a sweeping grace. The closing track is simply titled A Melody. This one reminds me a bit of David Lanz - thoughtful and fluid. What a great album! A true work of art, I give Our Mother my highest recommendation. "El tercer álbum del pianista suizo Ralph Zurmühle ha supuesto una más que agradable sorpresa para los sentidos. Our Mother es un trabajo inspirado y dedicado a la madre Tierra, donde un solitario instrumento es capaz de ofrecer voz a los momentos de la vida. Zurmühle es un compositor increíble y un visionario de la música; su piano es pura emoción, sus notas conocen la perfecta conjunción, capaces de narrar sin palabras una historia. Más de ocho minutos de intensa introspección. “Being There” desde su comienzo invita a cerrar los ojos, soñar y realizar un viaje lánguido, sin rumbo, adentrándose en los más profundos sentimientos que nos invaden. Nuestros miedos y nuestras debilidades brotan a la luz con la escucha de este tema. Sin abandonar el viaje que comenzó en “Being There”, “The Wind At My Back” se apoya en el rápido toque de notas para infundir arrojo y sufrimiento. Hermosa pieza, representante de un solitario e íntimo desconsuelo. Con un comienzo muy clásico se presenta “Horizon”, la pieza más profunda de todo el álbum. Con una melodía abatida y la sencillez como identidad, Zurmühle consigue profundizar en nuestras emociones, mostrándonos con sutiles toques las debilidades que nos invaden. “David And Me” es el tema que sigue a “Horizon”, nuevamente una composición reflexiva y perfecta para indagar en nuestro interior. Sobran las palabras, sólo hay que escuchar con atención. Otra de las grandes es “The Return”. Más apasionada que las pistas anteriores, Ralph compone una de las melodías más bellas del álbum, donde el vaivén de la música y los cambios inesperados realzan la belleza de la composición. “The Return” es fantástica, multitud de melodías encerradas en una misma pieza, pero tocada con una ternura y una técnica sobrehumana. Chapeau Maestro Zurmühle!. La pieza que cierra Our Mother es “A Melody”, una música encantadora, contraste de todas las anteriores. La música es cálida, dejando atrás los momentos de reflexión para disfrutar de la belleza que contemplan nuestros sentidos. De nuevo, el Maestro Zurmühle vuelve a encontrar las notas perfectas, pero esta vez, en una composición llena de afecto y sensibilidad. Our Mother fusiona notas increíbles para ofrecer voz a momentos silenciosos, donde los sentimientos hablan por sí solos y sin necesidad de acudir a la palabra, donde la visión del momento junto al sonido del piano es suficiente para transmitir fortísimas emociones. Our Mother contiene tan sólo nueve composiciones, las suficientes para vestir cualquier momento de la vida. Our Mother es un álbum muy altamente recomendable." Being There is the opening track of the CD, and it is a beauty. A lengthy piece at over eight minutes, the track has a slow, delicate opening and reminds me somewhat of a flower unfurling. Gradually, the piece develops and becomes quite uplifting. As with all of Ralph's compositions, the piece is easy to listen to, and I am in no doubt of the importance that this musician attaches to melody. The album's second track is more upbeat, with a faster tempo. This is perhaps explained by the title of the piece- The Wind at My Back. There is a definite sense of freedom in this piece and an element of fun as well. It makes for an enjoyable listening experience. Hymn is as majestic as the title would suggest. Indeed, when I first listened to this piece, I thought the opening bars sounded like a hymn without having seen the track titles. This is a very beautiful composition, much slower initially that the previous track. At around three minutes, the piece becomes quite dark and foreboding, before the original opening returns to add an air of calmness to proceedings once more. The next two tracks offer versions of one piece of music- Our Mother. The first combines piano with synthesisers, and the second is solo piano. Interestingly, the first version is almost twice as long as its solo-piano partner. As much as I enjoyed the piano / synthesiser version, for me there is no substitute for the solo-piano offering. Certainly, track four is very sedate, and the synthesisers are used very well to give the piece a truly soporific feel. There's an ethereal touch as well, reminding me a little of Constance Demby. The piece develops beautifully, and comes round full circle to end with the gentlest of touches. The solo-piano version of Our Mother is truly a delight. Here is a composer who is not afraid to use silence in his music. The melody is incredibly simple, but a joyful listening experience all the same. I imagine, judging by the album's seducing front-cover, that this piece is referring not just to the prayer from the "Essene Gospel of Peace", but also to the gentle beauty of Mother Nature. Oh for all days to be like this day. The album's stand-out track for me is Horizon, track six on this CD. Minimalist in form, this piece is achingly beautiful from start to finish. I am reminded of Arvo Pärt's "Spiegel im Spielgel" from his highly successful album "Alina". Rather like that music, Horizon is a lengthy piece, clocking in at a shade over twenty minutes- twenty minutes of pure heavenly bliss. I have listened to this track dozens of times, and never tire of its natural beauty. There are enough subtle variations and one or two surprises (such as an unexpected flurry of notes around the eleven minute mark) to stop this piece from becoming anything other than essential listening. Piano-Heaven was made for pieces like this. Put simply, this is one of the most gorgeous compositions I have ever heard, and its beauty lies in its simplicity. I also like the fact that this piece tells a story, and this story-teller is in no rush. This one track is worth the price of the CD alone. The fact that the album's other eight tracks are of such high quality is merely a very nice bonus. Track seven, David and Me is another perfect illustration for budding pianists as to how silence in a piece can be incredibly powerful. The track is extremely gentle and graceful, and although the dynamics increase later on, the track maintains its heavenly beauty throughout. It's another fairly lengthy track, at twelve minutes. The album's penultimate track is entitled The Return. I would love to know the story behind this track. The music is optimistic and quite invigorating. Again, the composer's ear for melody is evident to the listener. The piece is rather more upbeat than most of the album, but still manages to be incredibly relaxing. Our Mother closes with a delightful composition simply entitled A Melody. Needless to say, it lives up to its name! I am extremely impressed by this album. The recording quality is top-notch, and those high notes are crystal clear. I give it my highest recommendation, and suggest the reader also investigates the composer's other two albums- in particular the solo piano CD Between (2000) which is utterly gorgeous. Ralph Zurmühle has produced a remarkably consistent album in which every track is an outright winner. Piano-Heaven is indebted to artists like this. Take a bow, Mr. Zurmühle. You deserve it.